Roger Williams was a complex individual with a long and varied legacy of controversial and forward thinking ideas. Read on to learn more about the many sides of Roger Williams's life and teachings. Roger Williams was likely born in this tumultuous year, the same year that Queen Elizabeth died. He was the third of four children born to James Williams, a “Citizen and Merchant Taylor of London,” and Alice Pemberton Williams, from St. Albans, just northwest of London. They lived in Long Lane, a narrow passageway in the neighborhood of Smithfield, near the site of an ancient meat market. 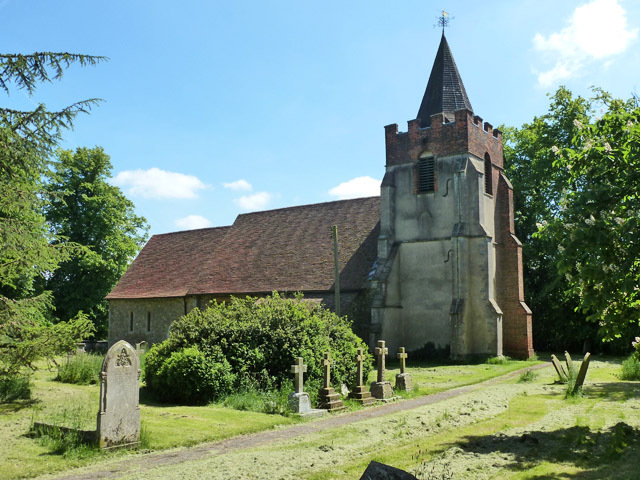 It was also a place where heretics were burned at the stake – a factor that may have shaped Roger’s eventual decision to leave England for America. London was a sprawling, densely-packed city of 200,000 people, facing constant challenges that included poverty, growing tensions over politics and religion, and the threat of disease (a plague was raging in the year that Roger was born). At the same time, it was a city that was constantly reinventing itself, especially with a new king coming in, and a new century yet to be defined. From this center, England radiated energy, whether measured by the ships that were sailing ever-greater distances, or the plays written every year by William Shakespeare, or an ambitious book project like the King James Bible. For a talented child, it must have been a thrilling place to begin life’s journey. 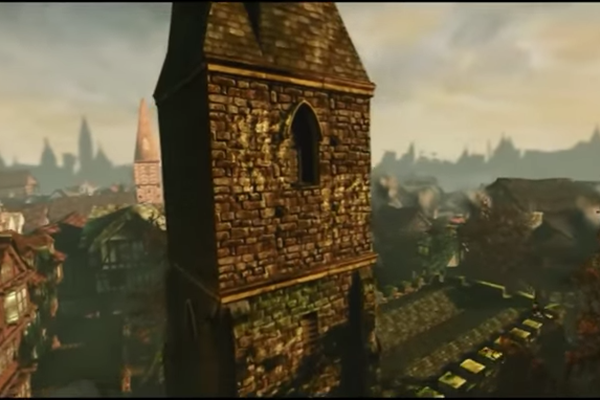 Six students from De Montfort University taking part in the Crytek Off the Map project, built a 3D representation of 17th century London before The Great Fire. 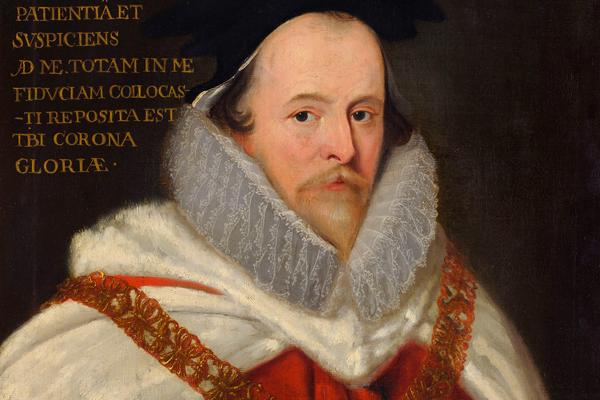 Inscribed ‘Lord Chief Justice Coke’, this portrait by an unknown artist depicts him in the traditional garb of a judge with his chain of office, ermine-lined red gown and black cap. In June 1621, Roger was admitted to The Charterhouse, a school with forty “scholars,” as the students were called. 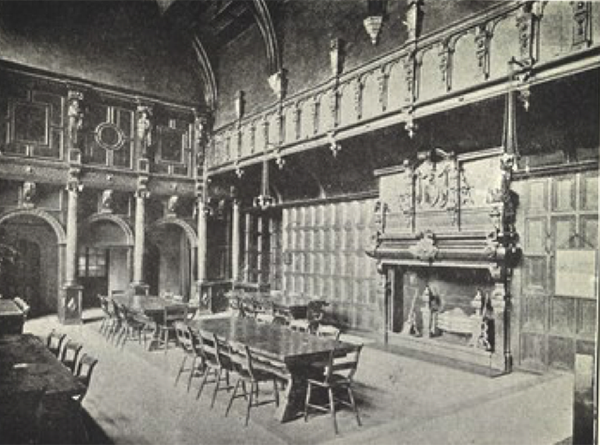 The Charterhouse, founded in 1611, also served as an almhouse for eighty elderly men. 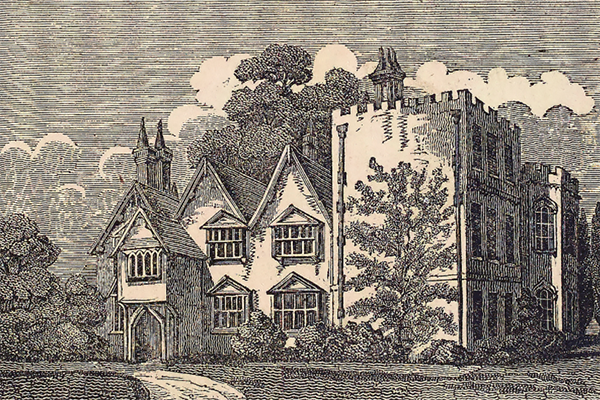 Sir Edward Coke was connected to The Charterhouse in several ways, and likely helped Roger to go there. In July 1624 Roger was one of three Charterhouse scholars chosen to be sent to university, and helped with an “exhibition,” or scholarship, to pay his expenses. The image shows "Cove Lane" as it was when the Williams family lived there. The Church tower in the lower right is their Church, St. Sepulchre. 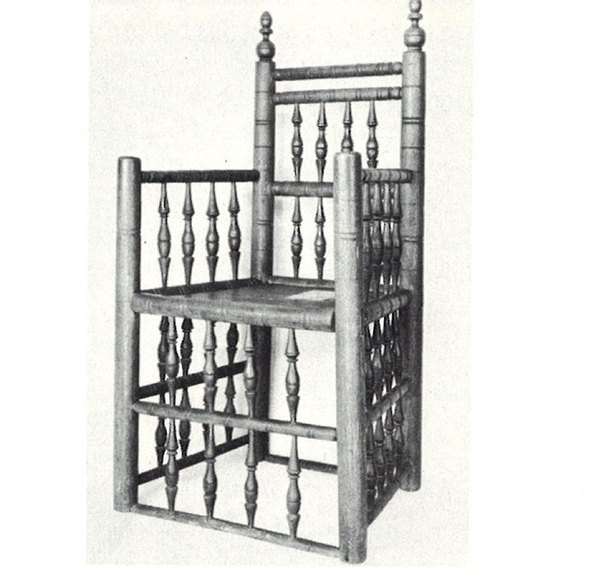 Source: Rhode Island Historical Society Collections, vol. XVI (July 1923). 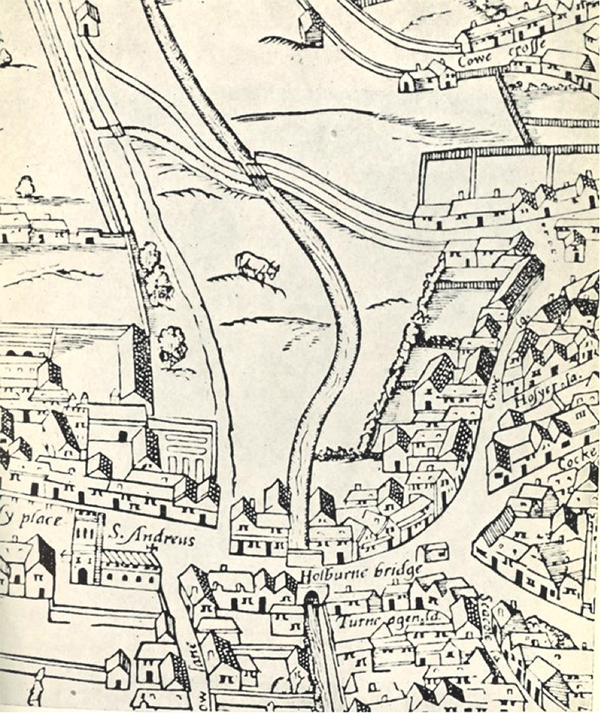 Roger was admitted to Pembroke College (then called Pembroke Hall) at Cambridge University and graduated in 1627 (although he held his “exhibition” until 1629). Pembroke was founded in 1347, and is the third oldest “college” at Cambridge. The chapel that Roger would have worshipped in is now the old library, and can be visited online or in person. Other graduates of Pembroke College, Cambridge include an English Prime Minister, William Pitt the Younger, the novelist Clive James, the comedian Peter Cook, and the actor Tom Huddleston. 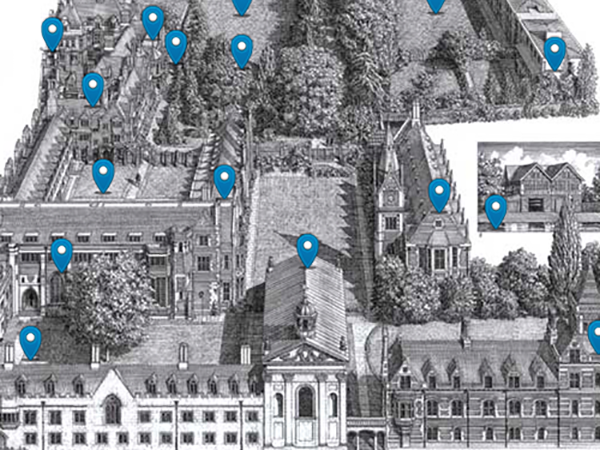 Take a virtual tour of Pembroke College, where Roger Williams received an education. After graduating from Cambridge, Roger was invited to become the chaplain in the grand home of Sir William Masham at Otes, near the village of High Laver, in the county of Essex. In Essex, he was near many Puritan leaders, then struggling against a growing number of restrictions from a new king, Charles I, and the Bishop of London, William Laud. 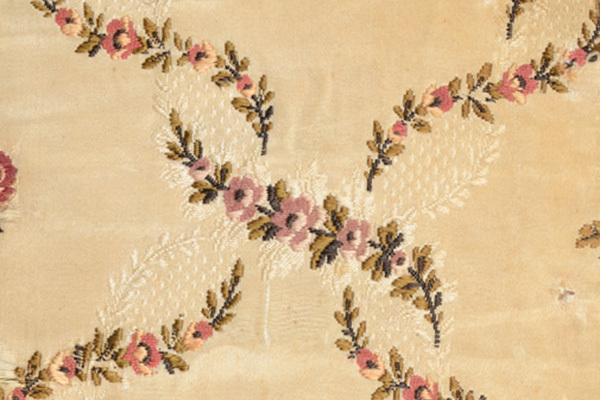 Many of the families that would soon be traveling to New England emigrated from Essex. Near the home where Roger served as chaplain was another grand estate belonging to Lady Joan Barrington, the mother-in-law of his employer, Sir William Masham. There he met a young woman, Mary Barnard, who was a maidservant to one of Lady Barrington’s daughters. Mary’s last name is usually given as Barnard, but according to many historians, she was the daughter of the clergyman, Richard Bernard.The couple were married on December 15, 1629 in the church of High Laver. That small church is also historic for another reason – its cemetery contains the grave of the phiolosopher, writer, and defender of human rights, John Locke. As tensions grew between the Puritans and the King, they began to organize a large migration to New England. The group that would go to Massachusetts secured the Charter of the Massachusetts Bay Company in 1629, and began to organize their departure. 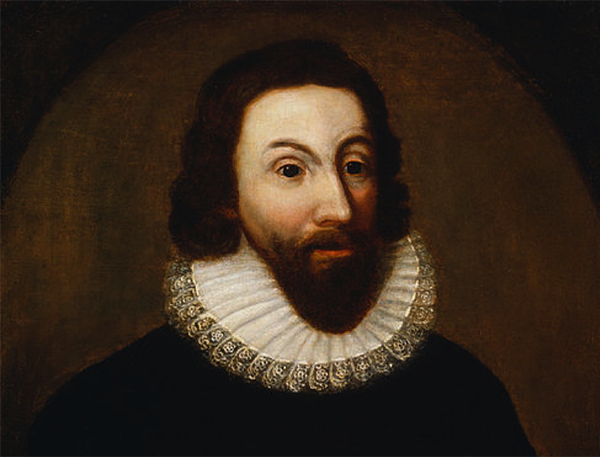 They began to sail in large numbers over the summer of 1630; nearly a thousand came in the first significant migration, behind the leadership of John Winthrop. On December 1, 1630, Roger set sail for Massachusetts with his wife Mary. About 20,000 settlers would leave England for New England between 1630 and 1640. 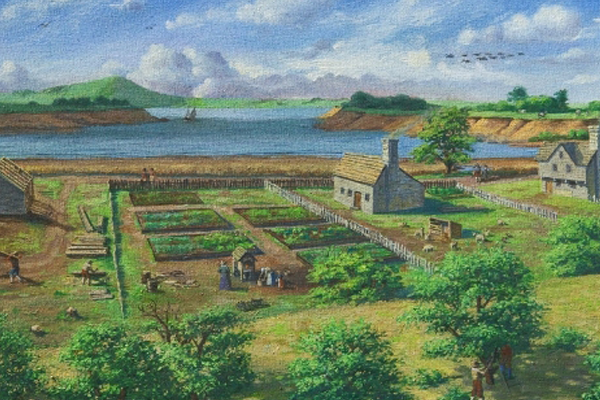 On February 9, 1631 Roger and Mary arrived at Boston, stayed a short time at Salem, and then moved to Plymouth, where they joined the small settlement of Pilgrims who had been living there since the arrival of the Mayflower in 1620. During his time in Plymouth, Roger began to spend time with the local Native Americans, the Wampanoag who had done so much to help the Pilgrims feed themselves. More than most of the English settlers, he devoted himself to learning their language, a skill that would prove essential when he was banished. In 1633 he wrote a pamphlet that was suppresed, which questioned the right of the English (and in theory, of the English King) to give away lands belonging to the Natives. In the fall of 1633, Roger and Mary left Plymouth and returned to Salem, where they continued to raise a family. Their first daughter, Mary, was born in August 1633. They built a house in Salem there that endured until the late 19th century. 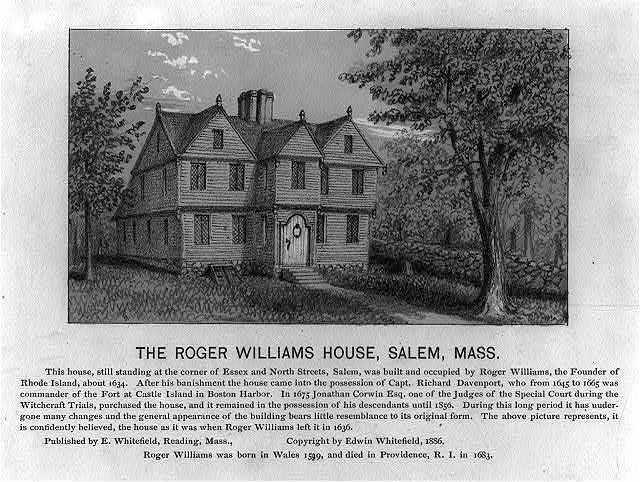 On April 1, 1635, Roger was appointed the “Teacher” of the Salem church. Here he made new friends, but he also made enemies, as he continued to criticize the local authorities for their refusal to separate church and state more clearly. 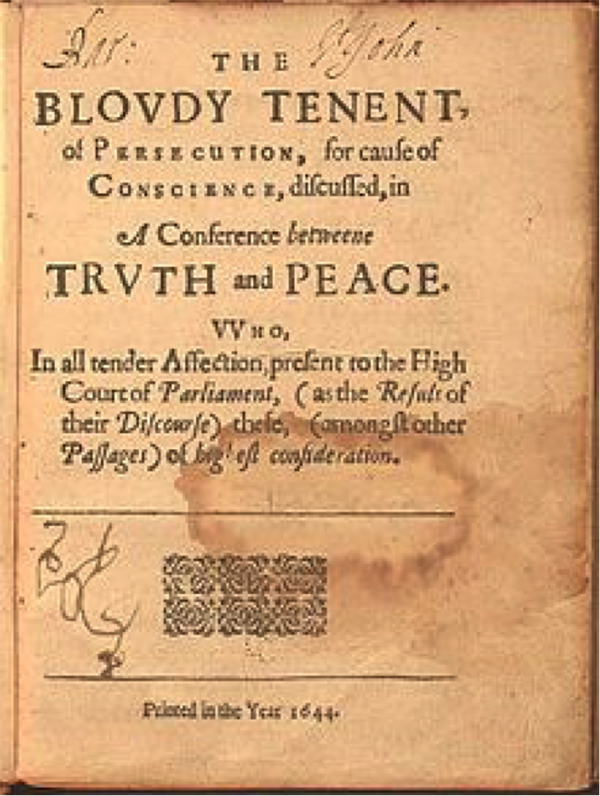 On October 9, 1635, Roger was banished by the General Court of Massachusetts Bay for dangerous opinions, including topics ranging from the relationship between church and state, the relationship between New England and Old England, and the treatment of Native Americans. He was granted a grace period of six weeks because his wife had just given birth to their son Freeborn. During the six weeks, he might have argued his case against banishment, but he continued to express his views during gatherings at his home, earning more anger. 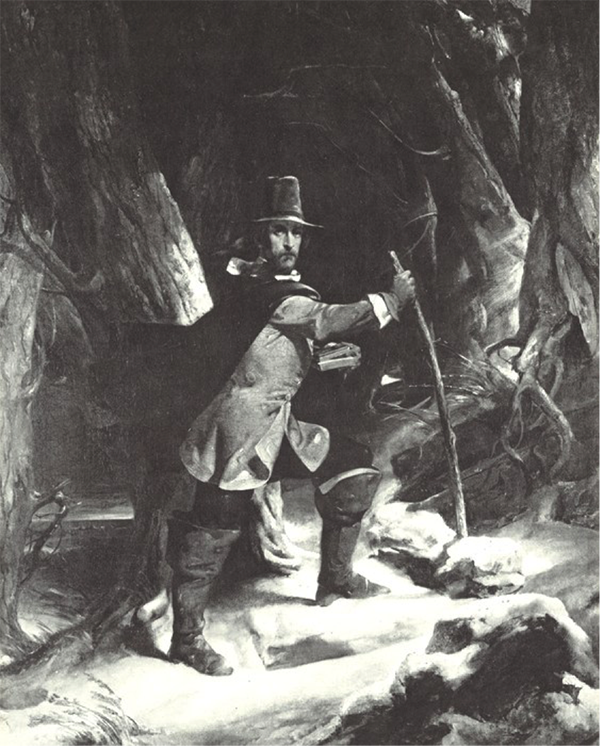 With the authorities closing in on him, Roger left Salem in January 1636 and headed toward the South. 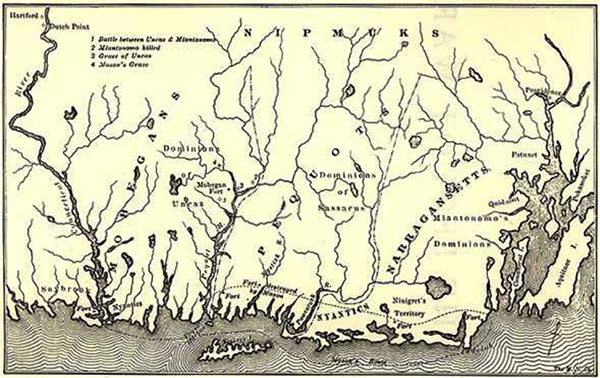 John Winthrop noted that Williams had been thinking about Narragansett Bay as a place to live even before he left Salem. According to a local tradition, Roger spent time living in a cave near Swansea, Massachusetts, where a local Indian woman named Margaret took care of him. 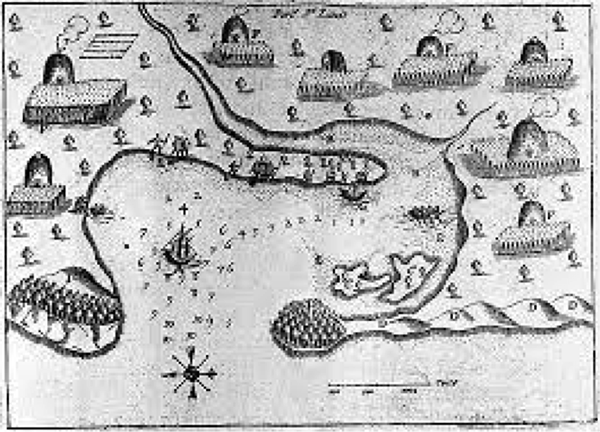 In the early spring of 1636 Roger settled briefly on the eastern shore of the Seekonk River, until he received a note from Edward Winslow, the new Governor of Plymouth, asking asking him to move across the river, away from his jurisdiction, and also that of the Wampanoag. 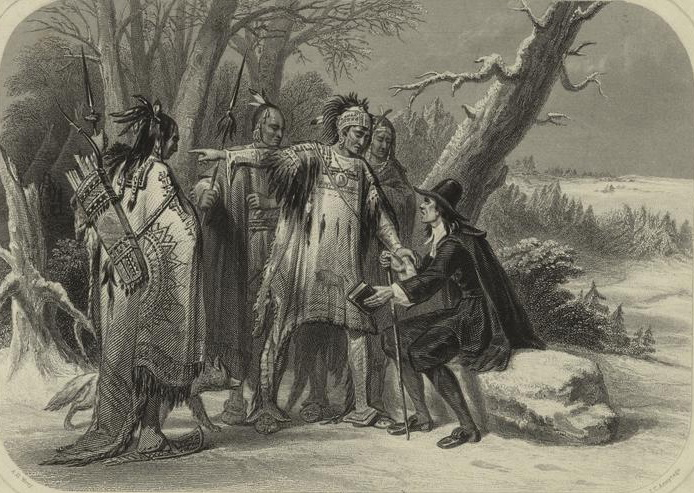 A 19th-century engraving, after a painting by A. H. Wray, depicting Roger Williams with Native Americans who gave him shelter during the winter of 1635-36. 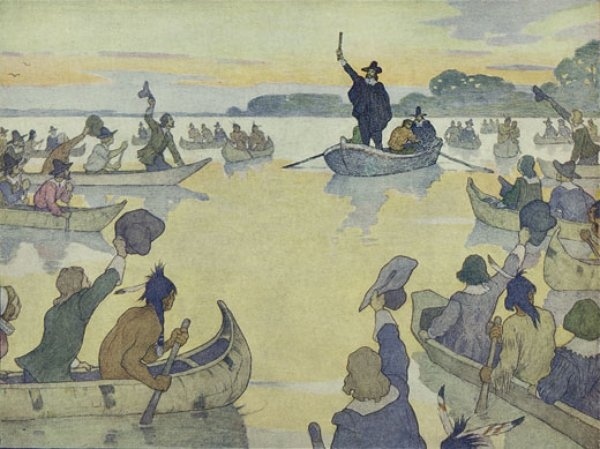 In March or April 1636, Roger rowed a canoe across the Seekonk River, where he was greeted by Narragansett, who according to tradition said, “What Cheer, Netop.” This phrase included an old English greeting, “What cheer,” and the Narragansett word for friend, “Netop.” The place of Roger’s landing was later called What Cheer Square; a rock that he stepped on was called “Slate Rock,” and was treated as reverentially as Plymouth Rock in Massachusetts. Pieces of it still exist around Rhode Island. So that more settlers could join him. Roger negotiated with the Narragansett chiefs, or Sachems, Canonicus and Miantonomo, to purchase more land around his settlement. He obtained the “Town Evidence” deed on March 24, 1638. 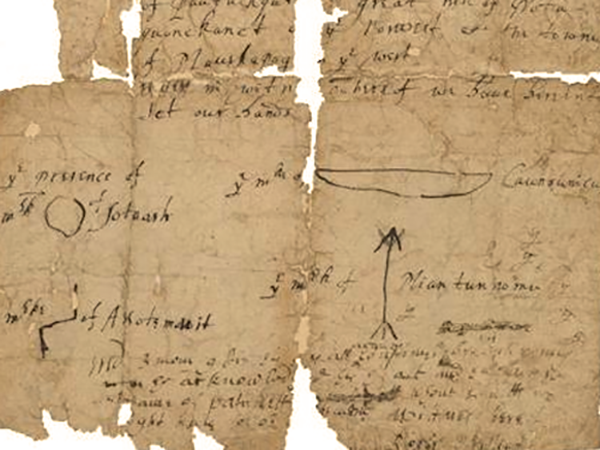 Deed to the settlement at Moshassuck, called Providence, signed by Narragansett Sachems Canonicus and Miantonomi and Roger Williams. Not long after his arrival, war broke out between the Pequots, a tribe in southeastern Connecticut, and the Narragansett and their English allies. Throughout the war, Roger acted as a mediator, hoping to stem the conflict. He wrote often to give news of the war to John Winthrop, the Governor of the colony that had only banished him a year earlier. 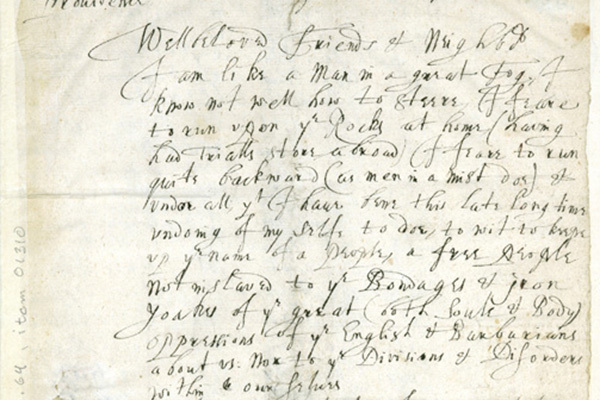 In one of his letters to Winthrop, dated July 31, 1637, Roger expressed the hope that Native captives would not be enslaved – a hope that was not fulfilled. 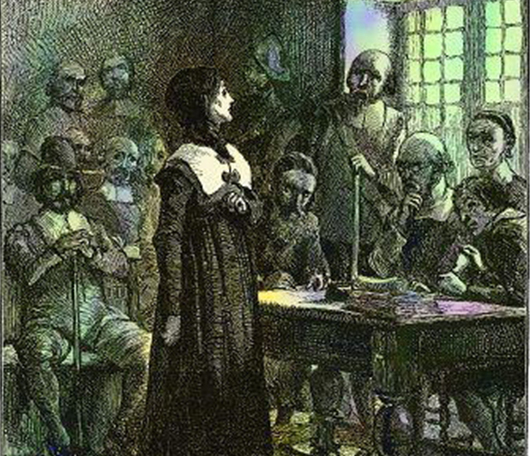 After antagonizing the authorities in Boston, much as Roger had, Anne Hutchinson was also banished from Massachusetts, and decided to move near Narragansett Bay. With help from Roger, she and her family and friends settled on the northern part of Aquidneck Island, in what is now the town of Portsmouth. Aquidneck, also known as Rhode Island, also attracted other settlers further South, at Newport, including William Coddington. 1901 Edwin Austin Abbey, coloring by Bartek Malysa. In the spring of 1639, Roger began to experiment with new religious ideas, some of which he learned from the sister of Anne Hutchinson, including the principle that adults should be rebaptized by immersing themselves in water. These experiments launched what is now the Baptist Church in the United States – why the large church on North Main Street is known as “The First Baptist Church.” Roger, ever restless, did not stay long in the Baptist category, and soon left to become a “Seeker” after divine truth. In the summer of 1643, Roger left Rhode Island for New Amsterdam (New York), and from there went to England to defend the legal status of the new colony he had founded. A civil war had broken out in England in 1642, and it was unclear who would decide whether Rhode Island was a legal concept or not. Eventually, through persistence, Roger was granted a “parliamentary patent”in 1644. 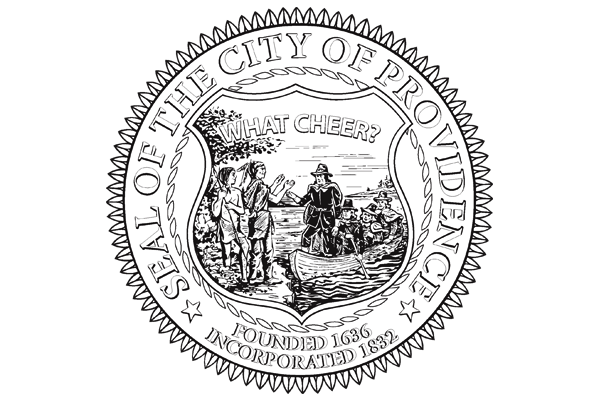 Roger was granted a “parliamentary patent”in 1644 – a document from Parliament that defined the Providence Plantations and Rhode Island. When he returned home, he was greeted by fourteen canoes, welcoming him back. 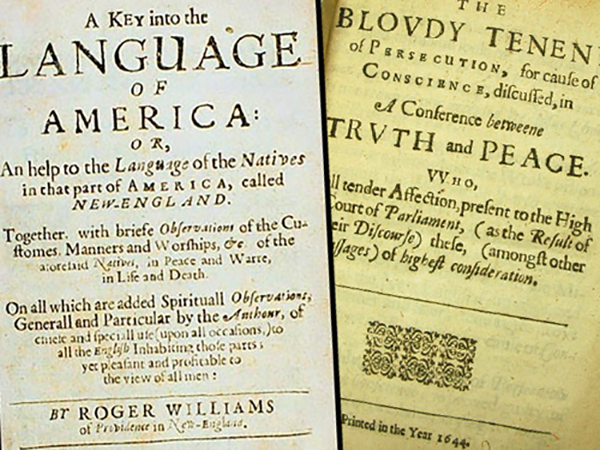 While in England, Roger published his first book, A Key into the Language of America. It revealed how much he owed to the Narragansett who had protected him and given him the land to begin his colony. The Key is full of lists of Narragansett vocabulary words, descriptions of their way of living, and admiration for their physical health and athletic ability. The book did well in England, and probably helped Roger to receive protection for Rhode Island. While in London, Roger also wrote several books that defended his philosophy of religious coexistence and the separation of church and state. These books were part of a long running argument that Roger led with John Cotton, the leading minister at Boston. They attacked what Roger called “the Bloody Tenent of Persecution,” or the idea that persecuting people would change their religious thinking. From 1644 to 1647, Roger was the chief officer of the Providence Plantations, helping the tiny colony to grow and to develop relationships with neighboring colonists and natives. In these years he was also trading with the Indians and the Dutch from his trading post at Cocumscussoc, in what is now North Kingstown. In 1649 he became the Deputy President. His family was growing; in addition to Mary and Freeborn, he and Mary had Providence (born 1638), Mercy (born 1640), Daniel (born 1641), and Joseph (born 1643). In November 1651, Roger sailed to England with John Clarke and William Dyer of Newport. They hoped to find a stronger charter for Rhode Island, despite the fact that England was in a great deal of turmoil (King Charles I had been executed in 1649). Roger stayed until 1654, when he sailed back with a safe conduct that allowed him to travel through Massachusetts Bay. While in England, he again wrote books, including another argument against persecution, and a book of his private religious thoughts, called,Experiments of Spiritual Life & Health. 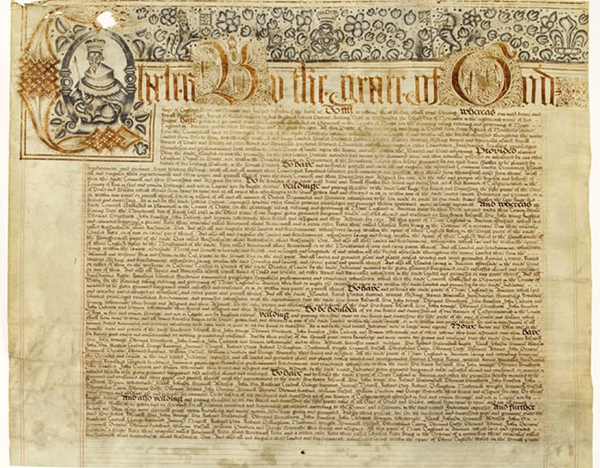 John Clarke finally secured an impressive charter for Rhode Island in 1663, after the monarchy had been restored, and Charles II was on the throne. In August 1672 Roger went to extraordinary lengths to argue against the spread of Quaker religious beliefs. Believing that a Quaker leader, George Fox, was at Newport, Roger rowed a boat all the way there to debate him. He was about 69 years old at the time. 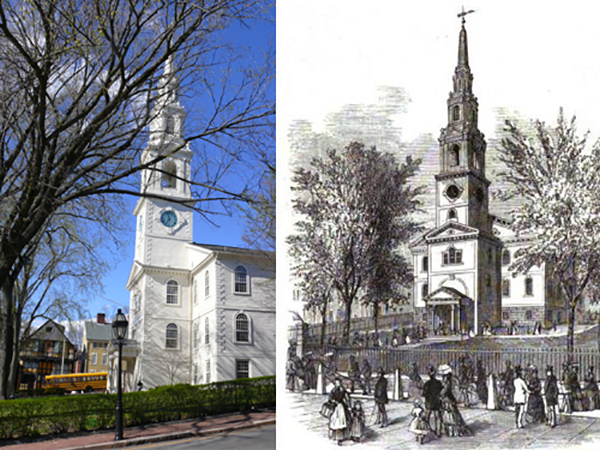 Fox had left Newport just before he arrived, but he found other Quakers to debate, which he did at Newport (August 9-12) and Providence (August 17). One of Roger’s last books was an attack on Quakerism, published in 1676 – but it is important to note that he never banished anyone for his or her religious beliefs. 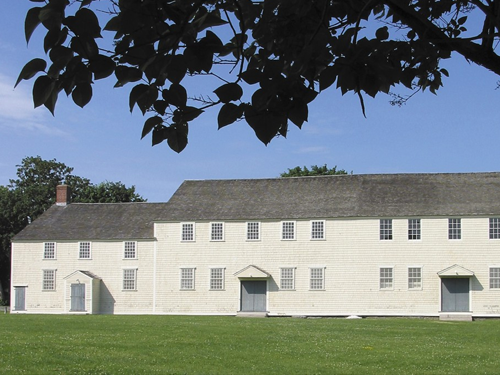 The Great Friends Meeting House, built in 1699, is the oldest surviving house of worship in Rhode Island. The most devastating war of early American history took place in and around Rhode Island. 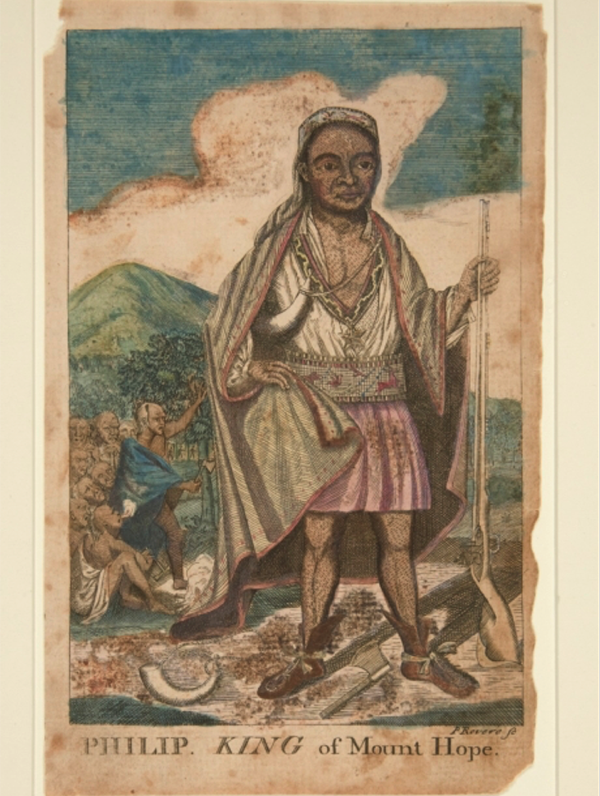 King Philip’s War began with hostilities between King Philip (also known as Metacom), the son of Roger’s old friend Massasoit, the Wampanoag sachem, and the English who kept expanding and demanding more land from the Natives. This time Roger’s abilities as a mediator failed him, and his old friends the Narragansett joined King Philip (their traditional rival) to make war upon the English. Unable to make peace, Roger was forced to join the soldiers of the colony that had banished him, as the English united against the Native Americans. A fearful cost was paid by each side, but the Natives and their culture were devastated by the conflict. Roger’s home and town were burned by the Natives on March 19, 1676. A letter that was likely written by him described his sadness at seeing so much of his work undone. Between January 16 and March 15, 1683, Roger Williams died at Providence, and was buried in the back of his home lot, halfway up the hill. There was no headstone when local citizens began to look again for his grave in the 19th century, but when digging in what they believed was the right area, they found an apple tree root in the shape of a skeleton (or so some claim). The remains were taken to the North Burial Ground, minus the root, which is in the Rhode Island Historical Society. Then the remains were removed again, to a site beneath the large statue of him at Prospect Park. The apple tree root that some think looks as if it had taken on the form of Roger Williams, traveling up the length of Williams's body, splitting at the hips, bending at the knees and turning up at the feet. 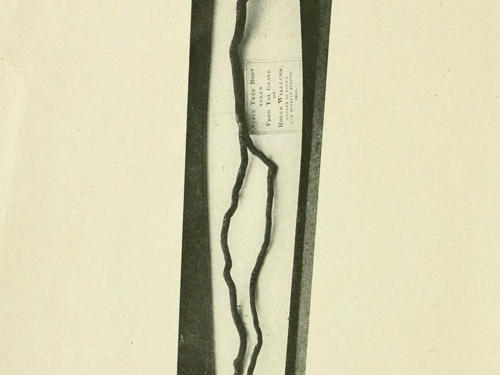 Since 1860 the Rhode Island Historical Society has cared for this special tree root as representative of Rhode Island's founder, and has had it on display in the John Brown House since 2007.